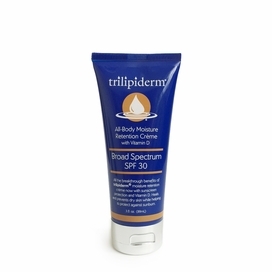 Trilipiderm represents the most innovative approach to healing dry skin. Their skin care line is a unique, all-body moisture retention crème that is made out of completely natural ingredients. Trilipiderm products are made with a purpose of being absorbed quickly into the skin to instantly relieve dryness and irritation. What's special about Trilipiderm is that the ingredients form a natural barrier to lock in moisture and decrease trans-epidermal water loss (TEWL). While hydrating your skin down to its very essence, Trilipiderm will replace lipids in the skin that have disappeared, while also helping to remove the appearance of wrinkles. Trilipiderm promises to improve the tone, texture, elasticity, and the overall look of your skin! Trilipiderm represents a harmonious blend of nature and science working together to effectively rejuvenate your skin.